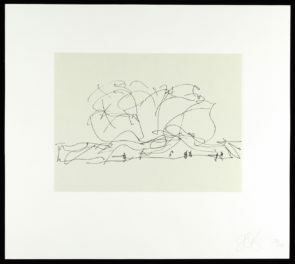 Analia Saban, the 2015–16 Getty Research Institute artist in residence, never stops exploring. An industrial laser cutter, a darkroom, and a sledgehammer are only a few of the tools in her Santa Monica studio. Although Analia employs numerous methods and materials, her approach to each work of art is surprisingly consistent: she questions the assumptions viewers might have about a given medium. She probes the properties of a material, testing its limitations and investigating its very essence. The end result is beautiful and often confounding, as is the case with her recent draped marbles (see photo below). Laid atop a sawhorse, the slabs of stone appear to sag. The heavy material looks like it should shatter and fall to the floor, yet it has taken on the properties of a wet towel. Analia’s artistic practice made her the perfect artist in residence for this past year’s research theme, Art and Materiality. 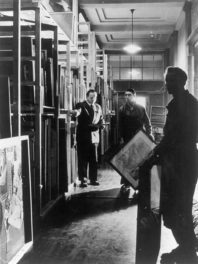 Each year the Research Institute hosts dozens of scholars, mostly art historians, whose work revolves around an annual theme. The Scholars Program also includes one artist, a sort of wildcard in a group of academics, who adds a different perspective on the topic. 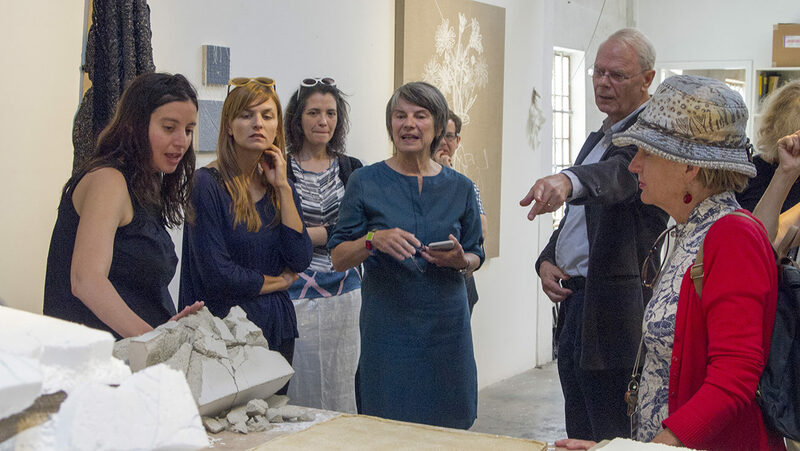 A mutual exchange of knowledge and ideas occurs among visiting scholars, Getty staff, and the artist in residence. The Scholars Program often spurs collaborative projects, including books, conferences, and museum exhibitions. Analia took advantage of the Getty’s many resources. She met with Getty Museum conservators to study X-rays of Renaissance sculptures, and she used the Getty Conservation Institute’s high-powered microscopes to get a very close look at pigments. But perhaps her most unexpected insight stemmed from a visiting scholar’s hobby. Kathryn Rudy, a professor of medieval art history at the University of St. Andrews in Scotland, was a Getty Scholar from September to December 2015. A passionate weaver, Kathryn purchased a loom during her stay in Los Angeles. Analia was fascinated with the weaver’s tool, and the two spent hours discussing the art form. At the end of Kathryn’s time at the Getty, the two friends agreed on a trade: Analia gave Kathryn one of her prints in exchange for the loom, which was, needless to say, far too large to fit in her luggage back to Scotland. The loom is now part of Analia’s artistic arsenal, which she is using to investigate the relationship between paint and canvas. For centuries paint has been applied to the surface of a canvas. With the help of the loom, however, Analia is discovering how to embed paint within the woven fabric. No longer merely a supporting element employed in service of paint, the canvas and paint co-mingle. Analia is in the exploratory phase with the loom, and it will be exciting to see how this tool influences her future artistic productions. 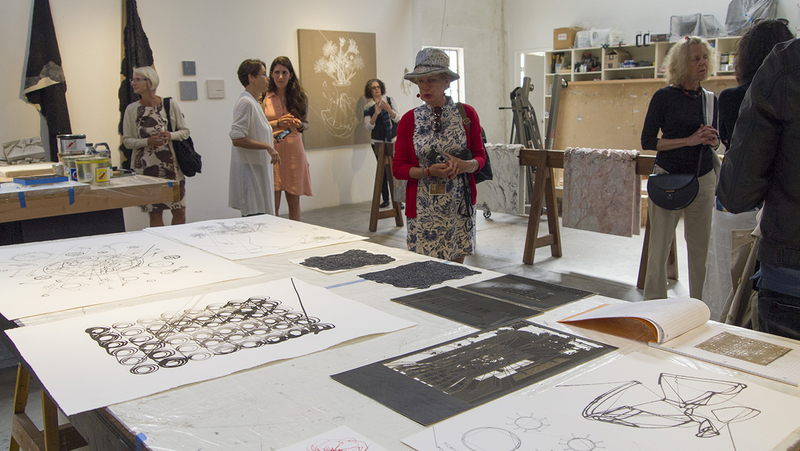 The Scholar Year ended in mid-June with a group visit to Analia’s studio. She generously hosted more than twenty Getty Scholars and Research Institute staff members (including me), providing an informal retrospective of her work. From the practical to the philosophical, she answered questions for almost two hours as a group of art historians and curators bubbled with curiosity and excitement. Perhaps the seeds of other projects were planted during her time at the Getty, or even during the studio visit—we’ll have to wait and see. Up next for Analia is a comprehensive exhibition of her works produced from 2005 to 2015, which will be on display at the Blaffer Art Museum at the University of Houston from September 24 through December 23, 2016. To explore more of her work, visit her website. I received my Ph.D. in Italian Renaissance art history from UCLA and I am now a research associate at the Getty Research Institute. My primary duties include facilitating the work of our visiting scholars and coordinating events for the Scholars Department. Before arriving at the Getty I taught art history courses at UCLA and California State University, Long Beach.